ACCRA, Ghana (AP) — A suspect in the slayings of a British actress and her two young sons has told a Ghana court he will return to the UK voluntarily, the court and his lawyer said Tuesday. Arthur Simpson-Kent after his appearance for extradition to Britain at the Law court complex in Accra, Ghana, Tuesday, Jan. 26, 2016. 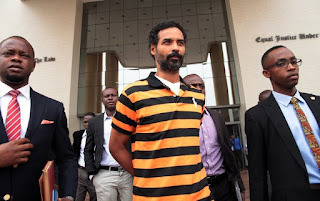 Arthur Simpson-Kent, 48, who was the boyfriend of former "EastEnders" actress Sian Blake, appeared in a magistrate court in Ghana for the second time for extradition to Britain, for possible murder charges. On the first day of an extradition hearing Tuesday, the head of Arthur Simpson-Kent's legal team, Justice Srem-Sai, said that his client has decided to return voluntarily and waived his right to challenge the proceedings. Simpson-Kent will remain in custody until a departure date is set, the lawyer said. When Ghana High Court Judge Merley Wood asked if he had voluntarily made the decision, Simpson-Kent replied "yes," adding that he had not been coerced into the decision. He first appeared in court on Jan. 12. State attorney Rebecca Adzalo had earlier informed the court they had received a 200-page extradition order against Simpson-Kent from the British High Commission through the Ministry of Foreign Affairs. Ghana police arrested the 48-year-old on Jan. 9 in the western coastal town of Butre. He fled to Ghana after speaking to detectives in Britain on Dec. 16 following the killings of his partner, former "EastEnders" actress Sian Blake, and her sons 8-year-old Zachary and 4-year-old Amon. Blake, 43, appeared in the long-running East-Ender's soap opera in 1996-1997.